Gently cleanses and removes make-up from the face, eyes, and lips without drying out the skin. For normal to dry and redness-prone skin. No-rinse cleansing water cleanses skin and effectively removes all traces of make-up on face, eyes and lips. Hydrates and calms the skin, leaving skin moisturized and soft. Pleasant fragrance tolerated by sensitive skin. Contains Avene Thermal Spring Water to soothe and soften skin. Apply morning/evening to face and eyes with a cotton pad. 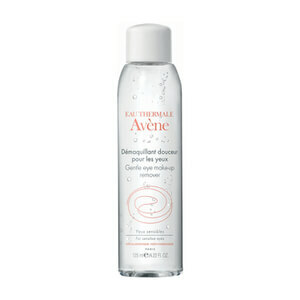 Finish with a fine mist of Avene Thermal Spring Water. Avene Thermal Spring Water, Pentylene Glycol, PEG-6 Caprylic/Capric Glycerides, Disodium EDTA, Fragrance, PEG-40 Hydrogenated Castor Oil, Sclerotium Gum, Sodium Benzoate, Sodium Chloride. I took my makeup off with this one time. Almost a week later I had to go to an eye specialist. My eyeballs and the skin around my eyes are severely irritated and swollen. I’m taking steroid drops. I’ve enjoyed several other Avene products. I actually use it as a toner to remove any remaining traces of make-up after washing my face with a regular cleanser. It's very gentle so you can even swipe it over your eyelids and it won't sting or burn. I have acne-prone skin and this cleansing water used as a toner has kept my skin smooth and clear. I tried this product because my mom recommended it and I really like it. But, if you're a make up girl you probably will not enjoy it since this is not very good at removing heavy make up. Any way I'm fine with my purchase although I only use it to clean my face and not really to remove make up. I love this cleanser! It cleanses well without drying my combination skin. I use it everyday morning and night. And it is gengle enough that I have used it to clean my toddler's face after she had put one of my red lipstick all over her face one day!